Final: Maeda Tadashi beats Maeda Hisashi (his brother!). Maeda Tadashi, an employee of a transport company, is the 2004 Companies Yokozuna, and so he could be makushita tsukedashi if he decided to join ozumo (but he's not interested in doing so). Sawai Gotaro (1,82m and 130 kg) is the 2004 High School Yokozuna. He has won four of the year's six other tournaments. 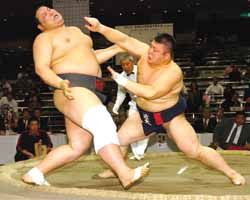 Sakamoto Akifumi, high school teacher, becomes the 2004 yokozuna in this category, and, though it is unlike he will do so, he could enter ozumo directly with the rank of makushita tsukedashi. 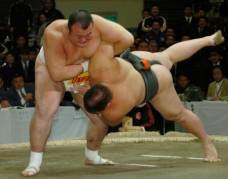 Hakiai Akifumi (1,76m, 138 kg) is the 2004 College Yokozuna and will be makushita tsukedashi if he decides to join ozumo. Nihon 4-1 Tokyo Agr. U.
Toganoki Takayuki, a Nihon Tsuun company employee, becomes the 2004 Amateur Yokozuna, and so he would be makushita tsukedashi if he were allowed to join ozumo (but at age 29, he is too old to do so). It's interesting to note that he has won all of his bouts using a single kimarite that he masters wonderfully: kotenage. This is the second year in a row that a company wrestler has won the title, after Kato did so in 2003. One more kotenage for Toganoki! Sawai: The fourth high school yokozuna in history who has been able to reach the podium of the National Amateur Championships (and the first one since Tamiya/Kotomitsuki), he is going to join the Sakaigawa Beya, where he will be Iwakiyama's teammate. He will have to begin in mae-zumo, at the very bottom of the hierarchy, but there is no doubt he will climb the ladder very quickly. Kageyama: Also a high school wrestler (from Maitoku Gijuku), he has won two major tournaments this year. So, he and Sawai have won all of the high school competitions in 2004! Kageyama is now going to join the famous Kasugano Beya, the heya of Tochinonada, Tochisakae and company. That looks promising! 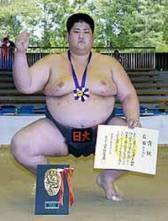 Hakiai: With his college yokozuna title, he should be the only makushita tsukedashi in 2005. Certainly less impressive than some of his predecessors, he still could be able to reach the sekitori ranks, if he uses his straight oshi-sumo style efficiently. Shimoda: Inefficient during the main Japanese competitions this year, he is still an exceptionally gifted wrestler. At 1,75 meters tall and 125 kilograms, he is quite similar to the smaller sized rikishi who are doing rather well in ozumo these days, like Kakizoe and Toyonoshima. Ichihara: This 20 year old heavyweight (157 kilograms at a height of 1,82 meters) Amateur World Champion is very promising, even if he has been disappointing during the main national events in 2004. Mori: In the end, on this season's Nichidai dream team, it is this second year wrestler who has been the most impressive, not only individually (earning bronze and silver in the most important tournaments), but also in his contribution to the team. Indeed, his victory over Kimura for the first bout of the college final was of crucial importance. He is supposed to go on dominating college competitions next year, and then he will probably join ozumo - through the high road, perhaps? And the others: Firstly, we can point out the other phenomenons from Nichidai, of course, Yoshida and Sakaizawa, and also the huge Yamamoto and Maeda; the former will join ozumo, making his debut in mae-zumo in March 2005 and adding a wrestler to the Oitekaze Beya's list. Among other wrestlers with high potential, we can also mention Tanaka and Kimura from Tonodai, Masuda from Kinki, and Nakanishi from Senshu.